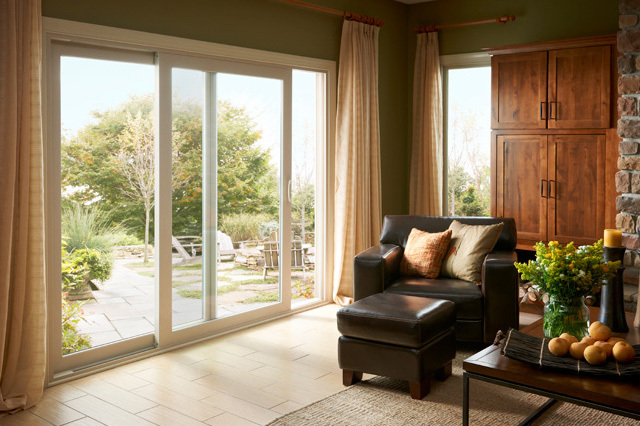 Is Your Sliding glass door a security risk? Unfortunately the security aspects of your home have had to become as important if not more important than energy efficiency, looks, durability etc. Sliding glass doors are especially vulnerable. When you think about it seems like a simple conclusion. Just break the glass and in an intruder comes. But thieves are looking for the easy and quite entrance to a home. Breaking a sheet of glass is noisy and attracts attention. Still using your sliding glass door as a point of entry is one of the most frequent methods of unlawfully entering a home. Older doors are especially vulnerable. There was a point when sliding glass doors were installed with the sliding portion on the exterior of a home. This turned out to be a very bad idea. Doors could be lifted or pried out of the track with relatively little effort. In some cases just lifting and twisting the door would be enough to make the locking mechanism break. This exterior sliding door type assembly would also allow the prowler to force the sashes apart enough to access the doors lock. That’s why doors are no longer installed this way. Door locks on sliding doors aren’t the best, although they have improved. It’s not that manufacturers want to put in poor locks on these doors it’s simply the area in which a lock can be placed, and the sliding motion of the door, lead to a weaker lock than say a deadbolt. But they have improved. Multipoint locking mechanisms have multiple alternate facing hooks that fit into the striker plate or “keeper” mounted on the frame. This gives the lock greater strength and resistance to jiggling. If you have an older door you might consider replacing it. But if you truly can’t replace that door right now there are some things you can do to increase your old (or new) sliding glass door’s security. Jimmy plates are wood or metal strips installed in the track above a door. They are used to eliminate vertical movement thus not allowing the door to be lifted up out of its track while still allowing normal everyday use. Safety bars are made of metal or wood and are installed in such a way as to prevent any horizontal movement of the door. A simple and inexpensive version would be a cut down wooden broom handle laid down in the track. More expensive models are mounted in the frame directly across from the lock and can be folded away when not in use. There are a great many manufacturer provided and aftermarket locks that can be added to your door. The main purpose of these locks is to prevent the sliding sash from moving. A hardened steel retractable bolt is attached to your door and when shut can be extended into the frame preventing any movement of the door. These are usually keyless spring and button operated locks. This is for safety as in the middle of a fire you really don’t want to be rushing around looking for a key. In many areas it’s against building code to install a keyed lock for this purpose. Whenever you make changes always keep in mind that poorly or incorrectly installed measures won’t increase your safety. Security features that people don’t understand can become a safety hazard. Everyone needs to know how to operate security features. And most importantly security features that aren’t used are basically a waste of money. Many a home has been entered by doors that weren’t even locked. Author fsparks2014Posted on August 8, 2014 August 7, 2014 Categories Sliding Glass DoorTags safety, security, sliding glass doorLeave a comment on Is Your Sliding glass door a security risk?